A tomato with blossom-end rot. A water-soaked spot at the blossom end of tomato fruits is the classic symptom of blossom-end rot. This relatively common garden problem is not a disease, but rather a physiological disorder caused by a calcium imbalance within the plant. It can occur in pepper, squash, cucumber and melon fruits as well as tomatoes. Blossom-end rot is most common when the growing season starts out wet and then becomes dry when fruit is setting. Damage first appears when fruits are approximately half their full size. The water-soaked areas enlarge and turn dark brown and leathery. These areas will eventually begin to rot, so the fruit should be picked and discarded. 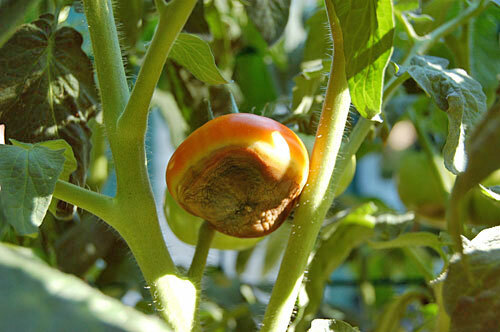 Tomato Rot Stop helps prevent blossom-end rot. Several factors can limit a plant’s ability to absorb enough calcium for proper development. These include: fluctuations in soil moisture (too wet or too dry), an excess of nitrogen in the soil, root damage due to cultivation, soil pH that’s either too high or too low, cold soil and soil high in salts. Maintain consistent levels of moisture in the soil throughout the growing season. When the weather is dry, water thoroughly once or twice each week to moisten the soil to a depth of at least 6 inches. Prevent calcium deficiency with Tomato Rot Stop. In cold climates, allow soil to warm before planting; cold soils limit nutrient uptake. Maintain soil pH at or near 6.5. Use fertilizers that are low in nitrogen and high in phosphorous, such as our GSC Organic Tomato Fertilizer. Use watering cones (Aqua Cones) to get water down into the root zone. Another good option is the Tomato Halo. Apply mulch, such as Red Tomato Mulch, to minimize evaporation and help maintain consistent soil moisture. Keep garden records: You may discover that some crop varieties are more susceptible to blossom-end rot than others. What causes thick skin on tomatoes and what can be done for it ? I have also had good luck preventing blossom end rot by adding dehydrated milk powder or crushed Tums. I believe the added calcium does the trick!